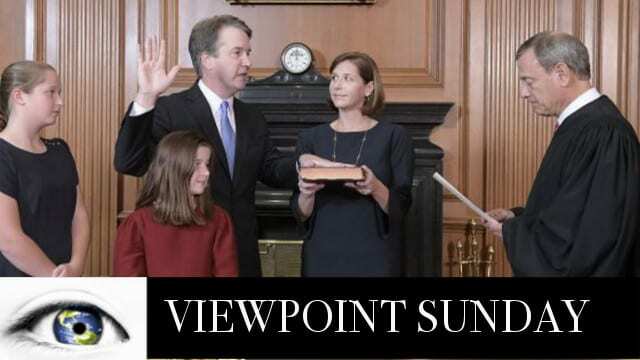 Viewpoint This Sunday – The scene unfolded Saturday afternoon as Kavanaugh was officially being placed on the nation’s highest court. Protestors could be heard throughout the halls of Congress, in the Chamber and on television screens from sea to shining sea. We will have extraordinary analysis and coverage of this historical moment and all the top stories on Viewpoint. Join us every Sunday 10 AM EST with an Encore Presentation at 6 PM on America Out Loud Talk Radio. Listen on-demand after 1 PM on Sunday on Podcast Networks Worldwide. Subscribe to Viewpoint on Apple Podcasts by clicking here. Look for our ONE YEAR ANNIVERSARY Program Special this October 28. Ilana Freedman and Jim McCay provide the analysis and in-depth discussion on the top stories that you need to know. Should Christine Blasey Ford be charged with perjury? Throughout the normal part of the confirmation process, it was clear that Democrat Senators could not defeat the Judge on normal practices of policy – so after the confirmation process had concluded (so we thought) there was the allegation of Christine Blasey Ford — which started a snowball effect. It got ugly real fast… at Senator’s homes, in restaurants, and elevators, screaming in Senator’s faces and throughout the hearings. Sen Cory Booker and Rep Maxine Waters, told the RESISTANCE Protestors to get up in the face of Republicans, at their offices, restaurants and homes! Dr James Mitchell will share his own first hand experience in dealing with the U.S. Senate and the psychology behind the madness! Senate Leader Mitch McConnell, in an interview with the Washington Post, called the opposition a “great political gift” for the Republican Party. “I want to thank the mob, because they’ve done the one thing we were having trouble doing, which was energizing our base,” McConnell told the Post. With the midterm elections a month away now, will Americans forgive and forget OR do they stay energized in bringing that anger to the polls? Dr Ron Martinelli and Ava Armstrong lay out the arguments and the lasting impact of these historical hearings.